The celebration known as El Día de los Muertos has various names used in diverse areas of Mexico and elsewhere in Latin America, including: El Día de los Difuntos (Day of the Deceased); El Día de los Santos (Day of the Saints); Todos Santos (All Saints); El Día de las Ánimas (Day of the Souls); and El Día de las Ánimas Benditas (Day of the Blessed Souls). A fusion of pre-Columbian and Catholic rituals for remembering the deceased, the celebration is observed on November 1 and 2 (the Roman Catholic dates of All Saints' Day and All Souls' Day) in varied ways depending on the country or region within a country. Most people in the United States (and in Mexico) assume that the celebration is "uniquely" Mexican; however, Day of the Dead is an important holiday throughout Latin America. Whether and how people observe it depends on a combination of factors related to one's geographical location, social class, ethnicity, and spiritual beliefs. Some common hemispheric traditions associated with Day of the Dead include visiting cemeteries on November 1 and 2 to decorate family graves; picnicking in cemeteries, serenading the deceased in cemeteries via strolling groups of musicians, or holding candlelit vigils in cemeteries; creating home altars for the departed; attending Catholic Mass or participating in novenas and other Catholic prayers for the deceased; walking in street processions; preparing special foods and drinks for the occasion; having a priest bless family graves and home altars; or taking part in ritual dances and games. 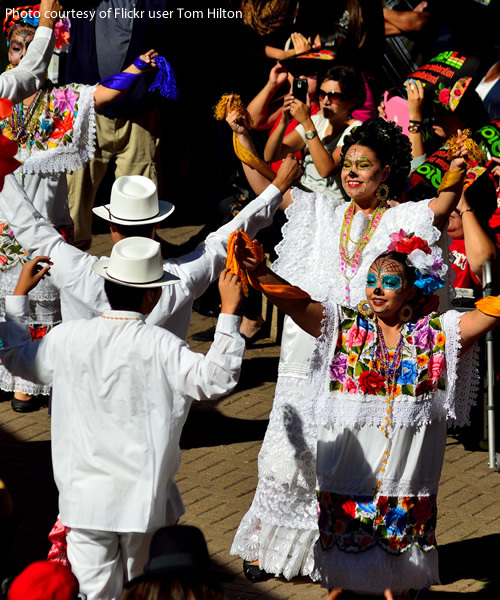 U.S. celebrations are modeled on Mexican traditions and, as the Latin American country with the largest tourism industry, Mexico's Day of the Dead is best known globally. But, if you travel to Guatemala, El Salvador, Bolivia, Ecuador, Peru, or the Andean regions of Columbia and Argentina, for example, you will see thousands of people visiting and picnicking in cemeteries, decorating graves, holding candlelight vigils by family tombs, serenading the dead via itinerant musicians, creating altars in memory of departed loved ones, and walking in processions. Thus, the celebration is not uniquely Mexican, although Mexico certainly has unique aspects of the celebration such as its famous sugar skulls and calavera (skeleton) imagery. It is often said that Mexico's skull imagery has Aztec origins, although there is scant evidence to support these claims. Some Mexican and Chicano/a intellectuals and artists have associated contemporary Mexican skull imagery with Mexico's indigenous past as a decolonialization strategy, preferring to identify with the country's indigenous rather than European history. But, according to Mexican historian Claudio Lomnitz, the comparison of sugar skulls to Aztec skulls is a modern development. Anthropologists Hugo Nutini and Stanley Brandes note stronger similarities between contemporary Mexican skull imagery and the humorous political skull caricatures popular in eighteenth and nineteenth century Europe. Sugar was introduced to Mexico by the Spanish, and sweet skull and bone treats were common in Europe during Mexico's colonial period. The pre-Columbian Mesoamerican area known today as Mexico was not a single, undifferentiated entity but a region of distinct cultures that had many different representations of death. The ancient cultures of the present states of Colima, Jalisco, and Nayarit, for example, rarely used skull imagery and although the Toltecs had skull imagery, its design and function was vastly different from contemporary Mexican skull imagery. So, we need to be careful about drawing direct lines of ancestry between ancient and modern Day of the Dead celebrations because when we do this, we erase complicated histories of cultural loss and struggle, decontextualizing the tradition from the effects of five centuries of colonization and the resulting alienation from and later re-appropriation of indigenous practices. Today, Day of the Dead is synonymous with Mexico, but these celebrations were fading away in Mexico by the 1960s, considered by "educated" Mexicans to be embarrassing superstitions of "ignorant" country bumpkins. In the 1970s, Mexico's government began aggressively promoting Day of the Dead for tourism, including in many parts of the country that had never celebrated it before. My book, Day of the Dead in the USA, discusses the role that nationalism, tourism, the mass media, and commercialization have played in the growth of the celebration in Mexico, the United States, and beyond. In the 1970s, Chicano/a educators and artists, who did not celebrate indigenous-style Day of the Dead rituals in the U.S. communities where they grew up, traveled to Southern Mexico to learn more about Mexican culture. They saw elaborate Day of the Dead altars, processions, and sugar skulls in places like Oaxaca and brought those traditions to the United States, creating altar installations in art museums, galleries, and schools. In the process, they transformed Day of the Dead into a celebration of Chicano and larger U.S. Latino identity (as non-Mexican Latinos joined them in these celebrations). Chicano/as changed the rituals from primarily family-centered and religious to primarily secular and public, where individuals being remembered did not have to be immediate family members. Many Chicano altar installations have honored the collective ancestors of U.S. Latinos—revolutionaries such as Che Guevara or Pancho Villa; artists such as José Martí, Frida Kahlo, Maria Félix, Rubén Darío, Celia Cruz, and Tito Puente; union organizer Cesar Chavez; and many others who have contributed to Latino history, culture, and politics. These new forms of celebrating Day of the Dead also influenced Mexico. Most of today's public Day of the Dead celebrations in Mexico and the United States are largely invented traditions that, like all cultural practices, grow and change with the times.